Oliver Cromwell famously called his victory in the last battle of the English Civil War “a crowning mercy” … but it was anything but for royalist nobleman James Stanley, who was beheaded a few weeks afterwards, on this date in 1651. Packing the marvelous title of Earl of Derby and the Marvel Comics-esque one of Baron Strange, Stanley was the maternal grandson of playwright Edward de Vere. He had fought the cavalier side in the 1640s and made his name notorious with the storming of Bolton that resulted in the Bolton Massacre. Weeks later, he was present when royalist fortunes went pear-shaped in the north at the Battle of Marston Moor. 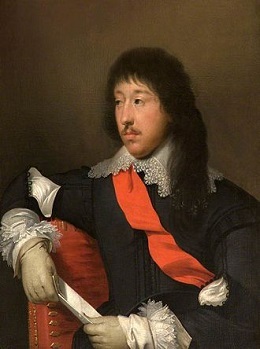 Stanley holed up on the Isle of Man after King Charles I lost his head, refusing his enemies’ every blandishment until he could re-enter the field as a commander for Charles II‘s reboot of hostilities. Though given terms by his captors, a court martial subsequently disallowed such liberality to the butcher of Bolton and condemned him as a traitor. The parliamentarians would take him back to Bolton to face his punishment; the spot of the beheading is marked by a column in Bolton’s market cross. Undependable local folklore holds that Lord Derby spent his last night in the ancient (and still-extant) Ye Olde Man and Scythe inn, whose environs exhibit some artifacts of Lord Derby, including a prop severed head. It’s even said that Stanley’s ghost haunts the pub. * Stanley was also the Lord of Mann (i.e., of the Isle of Man), and the efforts of Stanley’s wife to negotiate surrender of the royalist island in exchange for her husband’s safety triggered the rebellion of Illiam Dhone.